This is where you succinctly sell your company. Like your two-minute elevator pitch, this is the one to two pages where you engage the reader and potential investor. What does the future of your industry look like? How is your company scaleable? What are the next steps? Who are the owners of your company? Backgrounds? Experience in sector/business? When it comes down to it, the team matters just as much as the product or service, if not more so. Investors want to know your motivation and dedication to your product. This is where you put it. How are you going to use that money? OBJECTIVES: The steps you will take to reach that goal. CUSTOMERS: This is where you first talk about the status of your industry. What segment of the industry are you targeting? INDUSTRY: What is special about the industry? What short- and long-term changes do you see in the industry? How can your company react to these changes? STATUS OF OWNERSHIP: This is your legal status: corporation, LLC (limited liability corporation), sole proprietorship, partnership, etc. You may want to explain why you chose this legal status. What gives your product/service a market edge? Feel free to use an example that displays particular success or where what you are selling is unique. List here pricing for your product or fees for your service. PART II: Get into the features and benefits of each of your products or services. Break down the features and describe what service they provide. This is where you place all that research — statistics about your sector, etc. Show that you know your audience. This should be a blend of sharing stories from your business’ experience and providing second-hand research from reputable sources. Who are your main competitors? Then make it a bit more about you. What are the growth opportunities for a business of your size? What kind of presence do you have in the market already? How will you increase that? PART I: Talk about your customers — be specific about your target demographic/s, B2B?, B2C?. Then explain how you are reaching them: how you will sell your product/service. PART II: The competition. Who are your direct competitors? Indirect? This is where you show better than anything your market place. What is your advantage over them? PART III: Your niche: briefly describe what particular audience you attract and how you fit in your special part of the market — what separates you from the competition? PART IV: How do you get the word out of your company to that niche? What is your distribution channel? PART V: Promotion — How do you advertise now? How do you plan to expand your name? How much of your budget goes/will go to marketing? How will this retain current clients? Attract new ones? PART VI: Image/message — now that you’ve stated how you will advertise, What will you advertise? Describe your company in the way you want your customers to see it as. Your day-to-day. Who does what, when. Transportation — how do you get your product to your clients? third-party store? Legal requirements — Do you need permits? licenses? etc. What are the regulations you follow? Work with unions? etc. Personnel — Describe the type of positions you already have, plus what you may need to expand on. Inventory — Do you keep things in stock? Where? How much does that cost? What is the value of it? Providers/Suppliers — Who do you lease work out to? List names, addresses, websites. Timing for Accounts Receivable/Accounts Payable — Investors want to know about anything that could keep them from making a quick profit. Depending on the size of your company, you may choose to either create a hierarchical chart and/or to simply list your staff. Include a list of all your positions and employee names. Put credentials like CVs/Resumes, etc in the Addendum. 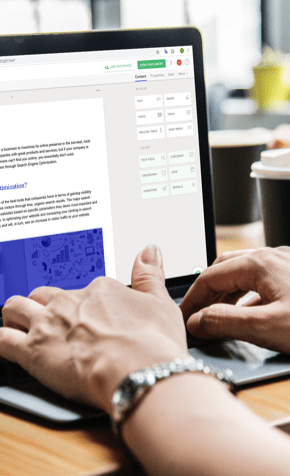 This is the part your potential investors are going to spend the most time reading, so you should spend the most time writing it. This is where you list what funds you have already gathered and by whom. List where it’s gone so far and where you think it will go. Make sure to add the line item “Contingencies” because, like it or not, pretty much every start-up goes over-budget. This is also where you include your Cash Flow Spreadsheet, which reflects what you expect to sell versus your expenses. Excel spreadsheet allows you to input values for revenues, cost of goods sold or services provided, other income and expenses. Cells for calculating profits and profit margins contain formulas which will use numbers input by you. This is also where you plan your Profits/Losses for at least the next 12 months. This spreadsheet could be used it the connection to the Cash Flow Spreadsheet. 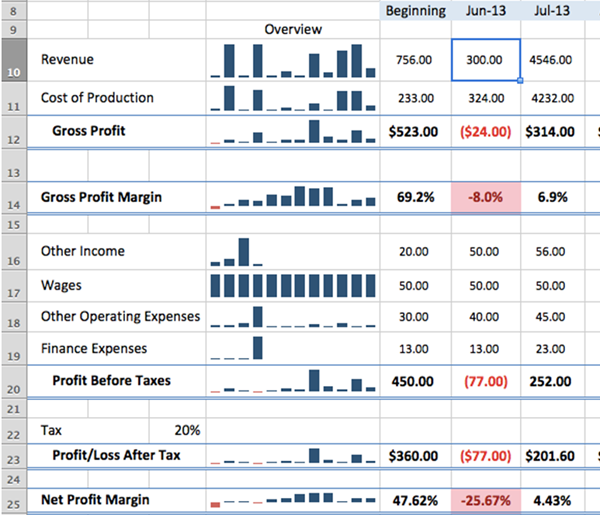 It also provides small graphical overview of all the input values as well as two graphs for revenue versus costs comparison and profits/losses summary. Finally, your potential investors want to see your Break-Even Analysis, which basically states how much you have to sell in order to cover all of your expenses and to break even. Cost-Volume-Profit Analysis requires the calculation of sales mix if more than one product is available. Sales mix could be calculated in the spreadsheet under “Actual Sales”. Those number should then be transferred to the “Break-Even Analysis” table. Download here for Excel spreadsheets for Cash Flow, Profit/Loss Analysis, Profit/Loss Graph, and the Break-Even Analysis, and download here for samples of each of the charts. Continue to the next pages to take advantage more examples and explanations of how to create each chart that’s crucial to your business plan. 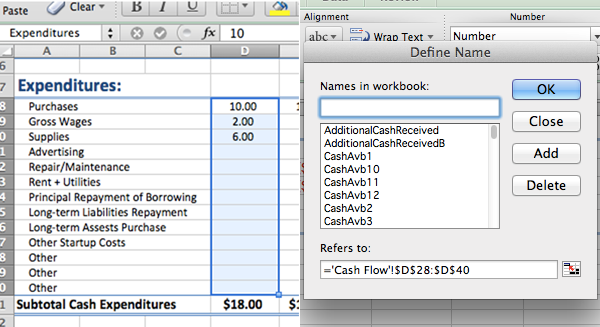 CashReceivedB, Expenditures, etc are the names of the sections. To name the cell of section of cells – highlight it and then rename in the upper left corner. Changing the name afterwards, if misspelled or deleting it completely, if reverting back to original cell name is done through “Insert -> Name -> Define”. Dates will be change automatically if the date in the “Fiscal Year Begins” is changed. Another section where investors would look is the present value of cash flows. It’s the sum of all cash flows discounted back 1 period using company’s annual rate of return, which is set by the company. I just made up a number. Cash Received is a section where someone would record all the cash inflow from different activities like operating or financial. Cash outflows are recorded in Expenditures. 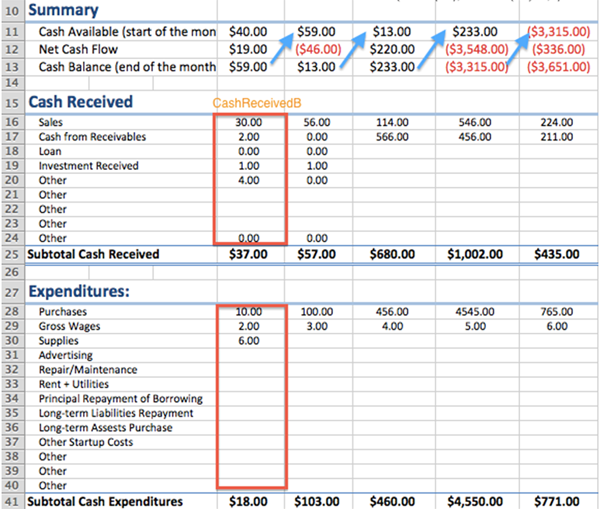 Both of these sections are summed in the subtotals: (=SUBTOTAL(109,CashReceivedB)). 109 – specifies the function that should be done by the subtotal, other could be used too, such as averaging; there are numbers from 1 to 11. With these two sections it is easy to find: Net Cash Flow = Cash inflow – Cash outflow. I also added two sections, which show how much money was in the beginning of the month, and how much is available at the end. That cash balance from previous month is transferred to the next month Cash Available section. Profit loss after tax = Profit before tax * (1 – Tax Rate) *However if loss was incurred, tax won’t be applied. To accommodate for that write the IF statement: if Profit Before Taxes > 0, then apply the formula above to that number, otherwise the negative number will be transferred to this cell. Overview is done with Sparklines. 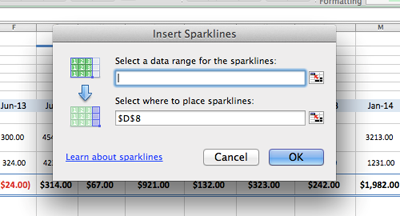 Select the cell where you would want to see the graph then Insert -> Sparklines. The window will pop up where you can choose the data to be shown. To customize the graph, click on one of them and the ribbon will show up, where you can choose different styles of presentation. Go to Insert -> Charts, highlight the data you are trying to present. 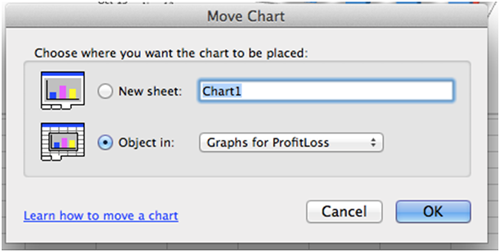 Charts ribbon has variety of options that will help you improve the look and style of graphs. Since the charts reference the same cells in the profit/loss analysis spreadsheet, updates in that table will automatically be reflected on the graph. In this part, the goal is to find current products sales mix, which will be used in the analysis. You need to input the price and number of units sold/services provided. Sales mix % is then found for each product. These numbers should be transferred by hand to the second table. This table is useful to quickly assess how different scenarios would affect the break-even points. You can copy the analysis table and paste it right next to each other for easier comparison. citations: sometimes you may include a statistic in your proposal, about your industry, your competitive market, etc., but you must cite it.